There is a saying that goes, “No one wants to see how the sausage is made”. When it comes to mortadella, though, I was desperate to find out how it is made in Italy and the story behind it. The question is what is mortadella anyway? FAQs – What is Mortadella? Like many kids who grew up in the States, I grew up on bologna sandwiches. I could spot that round plastic container, with the yellow backing, from a mile away. I still remember the sound it made, when that plastic backing was ripped off. The smell of the bologna, when it sizzled in a frying pan, is another thing I remember. Yes, my grandmother often made me fried bologna sandwiches, served on white Wonder Bread, with ketchup of course. An all American bologna lunch was served. As I got older I started to despise bologna, and most of the other lunch meats my mother served me. Liverwurst. Olive loaf. That fake turkey meat. Processed ham. It got to the point where I despised it all. I grew into an adult with a little bit of processed meat PTSD from my overly bologna saturated childhood. As I started to eat Italian cured meats, it took me some time to develop a taste. To me, the prosciutto was raw, pancetta fatty, and mortadella, was, well, baloney. It was round and pink, and to me “processed.” But, oh was I mistaken. I am not sure how the mortadella meat that was eaten by Italian American immigrants turned into American bologna. Obviously, there is the connection that mortadella was from Bologna, so I understand the name. But, I cannot understand what bologna became considering its grandfather is a meat that has been known for high quality for centuries. There has always been the running joke that no one knows what kind of meat is really in bologna. This is the first thing that differs from its Italian grandfather. Mortadella is made 100% from pork meat. Mortadella is one of the many DOP and IGP products in Italy, meaning its production and the mortadella ingredients are strictly regulated for quality. You certainly can’t say the same about bologna. Granted this little nugget came from Dictionary.com and should not be quoted as a reference on the history of food (although I am). But, it highlights the discrepancy between Italian mortadella, aka bologna sausage, aka baloney. As we began to travel in Italy, and as we started to become budding connoisseurs of Italian food, I started to grow accustomed to the Italian cured meats. In fact, I now crave them. I’m the one to suggest ordering a giant plate of meat. I’m left licking my fingers at the end of the course. When one of these platters of meat is delivered to our table, and I see thinly sliced pieces of mortadella, I get almost giddy. I want to pick the slice up above my face, lift my chin, and allow the mortadella to descend into my open mouth. I imagine that I look a little like a seal excited to be fed a big fish. But, I don’t care, because I love a good mortadella. Just don’t call it baloney. I would much prefer a mortadella sandwich than a baloney sandwich! I knew that I liked eating mortadella. But I wanted to learn about what is mortadella made from. Our guide picked us up at our hotel in Central Bologna, and we hailed a cab for our morning tour of Pasquini, one of the top mortadella producers in Bologna. It wasn’t very often that Mr. Pasquini opened his doors for tours of his decades-old production facility. Pasquini mortadella is very popular with the locals. Popular enough that there was a steady stream of customers coming in and out during our visit. But, not many people know that the Pasquini mortadella is still made within the Bologna city limits, just outside of the city center. In a small building tucked into a neighborhood, there’s no indication as to what goes on behind those doors, other than a small sign with Pasquini’s signature pig logo. It’s so hidden that our taxi driver was confused, thinking we were driving to a different Pasquini, an optometrist nearby. I was also pleasantly surprised that Mr. Pasquini greeted us himself. I expected a tour from one of this employees, but to receive the inside scoop from a mortadella master was special. Mr. Pasquini was about to show us how the sausage is made. It’s a fairly simple process that involves a few different steps of pressing and grinding pork meat, along with the characteristic white bits of fat. Those white bits are actually the meat from the throat of the pig. Mr. Pasquini explained how to tell if it’s a high-quality mortadella: the white bits should remain connected to the pink meat after it is cut. If the white pieces start to separate, you are definitely not eating Pasquini. Essentially, all of this is mixed with a little seasoning, including salt and white pepper. I knew Mr. Pasquini would never share his secret mortadella recipe with us but it was to watch. It’s all filled into a giant mortadella casing and then, the real fun happens. 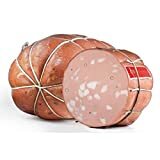 The casing is tied at one end, and then the entire mortadella, which weighs at least 12 or 14 kilograms, is carefully tied over and over again. This helps the mortadella to retain its shape while it hangs, and while it’s cooked in a large, dry oven, for about 22 hours. There was a team of about five employees walking through each of these steps. At one point, Mr. Pasquini stepped away from our tour to do some of the tying himself. He implied it was because they had to get the work done and if he didn’t help out it would never be finished. But, I think he wanted to show off his tying skills alongside the young guys he was training. After all, he’s the mortadella master. After seeing the process from beginning to end, of course, Mr. Pasquini offered us some samples of his thinly sliced mortadella. It was like a dream come true for me. And, in this case, I was happy to see how the sausage is made. I still don’t understand the connection between mortadella and bologna. As that Dictionary.com definition states, bologna is made from odds and ends. Mortadella is made with high-quality pork and nothing else. And, when you see mortadella on a menu when traveling in Italy, please don’t dismiss it based solely on its American namesake, and nemesis. See more behind the scenes at Pasquini and learn how real mortadella is made! What do they call mortadella in Italy? Many people are confused about what to call mortadella, more than just the mortadella versus baloney conversation. Some people refer to this product as mortadella ham or mortadella sausage. But, in Italy, it’s just called mortadella. What is the difference between Bologna and mortadella? As discussed above, bologna in the US is normally baloney. Whereas Mortadella Bologna in Italy is real authentic mortadella. What is mortadella meat? The mortadella meats are only pork. 100% pork! I’ve also been asked if mortadella is made from horse. Absolutely not! Although horse meat is commonly eaten in Italy, it is not one of the mortadella ingredients. Is mortadella cooked? Yes, it spends just under 24 hours hanging in an oven before it’s complete. What is a substitute for mortadella? Italians would probably say there is no substitution for mortadella! But if you have a recipe that calls for mortadella and can’t find it near you, try a higher quality baloney, perhaps from Boars Head or an artisan producer. What does mortadella taste like? Mortadella has a mild pork flavor. It’s not as strong as bacon, but more pork-flavored than a pork chop or pork loin. It also has a thicker mouthfeel than prosciutto. Looking for more travel tips on Emilia Romagna, and how to eat the best food in Italy? My book The Food Traveler’s Guide to Emilia Romagna: How to taste the history and tradition of Italy is available for purchase or download on Amazon. If you are a NOOK reader, it is also available for download on Barnes and Noble. We were hosted by the Emilia Romagna Tourism Board during our stay in Emilia Romagna. Although it’s possible to book a lot of culinary tours to explore the region, visiting Pasquini is nearly impossible. This was a special trip booked by the tourism board. Although you can stop by the shop and purchase mortadella, as well as other meats. And, it’s possible to purchase Pasquini products all over Bologna, and around the region. Unfortunately, Mr. Pasquini passed away shortly after our visit, but his Mortadella Bologna legacy hopefully will live on. Learn more: Get the only guide you would ever need for Bologna, the The Food Traveler’s Guide to Emilia Romagna: How to taste the history and tradition of Italy from Amazon. Or, get a copy of Pellegrino Artusi’s The Art of Eating Well to learn to cook traditional Italian cuisine at home. Learn more about mortadella recipes on Amazon, or you can even buy mortadella to be shipped to your home. For more listen to our podcast about Italian cured meats. Is it easy to find in the US? Speciallity butcher shops. How about mega grocery store? I’m in KC Mo. It’s definitely easy to find in delis and specialty butcher shops in the bigger cities, including Chicago, but I am not sure about KC. Maybe google Italian food stores in KC and that might help. If you have a Whole Foods they also might have it. Good luck.